1. a thin layer or coating. 2. a thin sheet of material (e.g., gelatin, cellulose acetate) specially treated for use in photography or radiography; used also to designate the sheet after exposure to the energy to which it is sensitive. bite-wing film an x-ray film with a protruding tab to be held between the upper and lower teeth, used for a bite-wing radiograph of oral structures. gelatin film, absorbable a sterile, nonantigenic, absorbable, water-insoluble coating used as an aid in surgical closure and repair of defects in the dura mater and pleura and as a local hemostatic. spot film a radiograph of a small anatomic area obtained either by rapid exposure during fluoroscopy to provide a permanent record of a transiently observed abnormality, or by limitation of radiation passing through the area to improve definition and detail of the image produced. See also spot-film radiography. x-ray film film sensitized to x-rays, either before or after exposure. Cross-sectional view of radiographic film. The bulk of the film is the base. The emulsion contains the diagnostic information. From Bushong, 2001. 1. A thin sheet of flexible material coated with a light-sensitive or x-ray-sensitive substance used in taking photographs or radiographs. 2. A thin layer or coating. 2. a thin transparent sheet of cellulose acetate or similar material coated on one or both sides with an emulsion that is sensitive to light or radiation. absorbable gelatin film a sterile, nonantigenic, absorbable, water-insoluble sheet of gelatin, used as an aid in surgical closure and repair of defects, and as a local hemostatic. bite-wing film an x-ray film for radiography of oral structures, with a protruding tab to be held between the upper and lower teeth. plain film a radiograph made without the use of a contrast medium. spot film a radiograph of a small anatomic area obtained either by rapid exposure during fluoroscopy to provide a permanent record of a transiently observed abnormality or by limitation of radiation passing through the area to improve definition and detail of the image produced. 1. A light-sensitive or x-ray-sensitive substance used in taking photographs or radiographs. 2. A thin layer or membranous coating. 1 a thin sheet or layer of any material, such as a coating of oil on a metal part. 2 (in photography and radiography) a thin, flexible transparent sheet of cellulose acetate or polyester plastic material coated with a light-sensitive emulsion, used to record images, such as organs, structures, and tissues, that may be involved in disease and diagnosis. 1. Thin sheet of flexible material coated with a light-sensitive or x-ray-sensitive substance used for radiographs. n a thin, flexible, transparent sheet of cellulose acetate or similar material coated with a light-sensitive emulsion. n a pack of radiation-sensitive film used for the detection and approximate measurement of radiation exposure for personnel-monitoring purposes; the badge may contain two or three films of differing sensitivity, and it may contain a filter that shields part of the film from certain types of radiation. n See examination, bite-wing, intraoral radiographic and radiograph, bite-wing. n a defective result in a radiograph; usually caused by a chemical, physical, or electrical error in its production. n.pl the spots caused by dust particles or developer on the films before development; also caused by outdated (expired) film. n a fault caused by film movement during exposure, bent film during exposure, double exposures, or flowing of emulsion during processing in excessively warm solution. n the result of treating the film with fixer before developing or by excessive washing. The problem can be prevented by following appropriate procedures. n a fault caused by overexposure of the film to radiation, film fog from extended development, accidental exposure to light (light leaks in film packet or dark room), or an unsafe darkroom light. n a fogging of the radiograph, characterized by the appearance of a pink surface when the film is viewed by transmitted light and a green surface when the film is seen by reflected light. It usually is caused by an exhaustion of the acid content of the fixing solution (incomplete fixation). n a fault caused by stray radiation, use of expired film, or an unsafe darkroom light. n a fault caused by underexposure, underdevelopment (expired or diluted developing solution), development in temperatures that are too cold, or accidental use of a wrong film speed. n a network of corrugations produced because of an excessive difference in temperature between any two of the three darkroom solutions. n.pl the dark lines on films caused by contaminated chemicals in automatic film processing units. Prevented by cleaning and replenishing the developer and fixer solutions regularly. n a fault caused by contaminated solutions, improper rinsing, exhausted solutions, improper washing, contamination by improper handling of the emulsions during or after processing, or film hangers containing dried fixer on the clips. Stain of the film fixer. n an image in the emulsion that has the appearance of lightning. Caused by rapid opening of the film pocket or transfer of static electricity from the technician to the film. 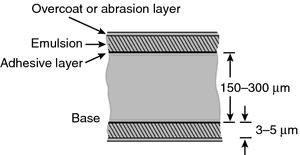 n a fault caused by air bubbles clinging to the emulsion during development or by fixing solution spotted on the emulsion before development. n an instrument or device for holding radiographic film during processing procedures. n the shadow of a structure as depicted on a radiographic or photographic emulsion. n a procedure for processing radiographic films involving submerging the films in a sodium hypochlorite solution for anywhere between 30 seconds and 5 minutes. The solution should be 5.25% sodium hypochlorite. n the placement of radiographs in an orderly sequence on a suitable carrier for illumination and study. n a small, lightproof, moisture-resistant, sealed paper or plastic envelope containing a radiographic film (or two radiographic films) and a lead-foil backing designed for use in making intraoral radiographs. n the positioning of the radiographic film to receive the image cast by the roentgen rays. n a chemical transformation of the latent image, produced in a film emulsion by exposure to radiation, into a stable image visible by transmitted light. The usual procedure is basically a selective reduction of affected silver halide salts to metallic silver grains (development), followed by the selective removal of unaffected silver halide (fixation), washing to remove the processing chemicals, and drying. n the chemicals that arrest the process of film development and also neutralize leftover developer. n a fast and efficient method of processing in which the film is mechanically transferred from the developer to the fixer, is washed, and finally is dried. n the use of high-speed chemicals or elevated temperatures to reduce processing time. n the amount of exposure to light or roentgen rays required to produce a given image density. It is expressed as the reciprocal of the exposure in roentgens necessary to produce a density of 1 above base and fog; films are classified on this basis in six speed groups, between each of which is a twofold increase in film speed. n the thickness of a layer of material, particularly in reference to dental cements. In standardization tests, film thickness is the minimal thickness or layer obtained under a specific load. n a major virus family, to which both the Marburg and Ebola viruses belong. Viruses in this family have a single-stranded RNA molecular structure with complex symmetry. 2. a thin sheet of material (e.g. gelatin, cellulose acetate) specially treated for use in photography or radiography; used also to designate the sheet after exposure to the energy to which it is sensitive. a radiographic film worn as a badge and used for detection and approximate measurement of radiographic exposure of personnel. enables the radiographer to change films quickly when a series of shots is being used, e.g. angiography. film with a special reversal emulsion so that a contact print can be made with white light. Called also duplicating film. 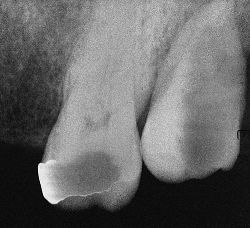 nonscreen film used in dental radiography. a film lacking in radiographic contrast. a sterile, nonantigenic, absorbable, water-insoluble coating used as an aid in surgical closure and repair of defects in the dura mater and pleura and as a local hemostatic. details of the animal examined and when and where the examination took place. Usually made on the x-ray by photographic means or by using radiopaque tape. any device, usually lead letters, placed on the film to indicate which part of the animal was examined and the projection used. film for getting very fine detail, used without a cassette and requiring long exposure time. This film is now banned in some parts of the world. an x-ray film taken without contrast medium or other special effects. Often an exploratory or scout film. a radiograph of a small anatomic area obtained (1) by rapid exposure during fluoroscopy to provide a permanent record of a transiently observed abnormality, or (2) by limitation of radiation passing through the area to improve definition and detail of the image produced. fine-grain, medium-speed with wide tolerance for exposure times. film sensitized to x-rays, either before or after exposure. A 7th Art Releasing release of a Clear Lake Historical Prods. AaAaAa Critics continues to fulfill their mission of providing a forum for engaging ideas about cinema, the President of the Moroccan association of film critics told MAP, adding that "we cannot imagine the 7th art without criticism. Abu Dhabi Tourism & Culture Authority (TCA Abu Dhabi) and Image Nation Abu Dhabi have teamed up to launch The 7th Art, a new screening series which will explore the history of film and its relationship with other art forms.